With the InterFAX Send service, you can send faxes to other fax numbers. When using the InterFAX API, you can check the status of the fax until processing of the fax is completed (and the fax is either sent successfully or is marked as failed). 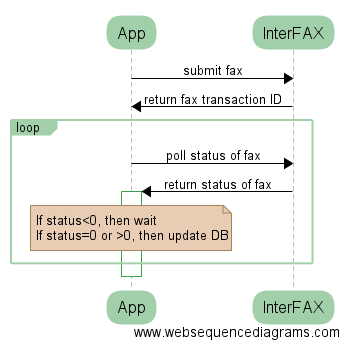 Once your application submits the fax to InterFAX's API, you will receive as the response a unique transaction ID for this fax. You can store this ID in your local database and then query the status of this (and others as well) ID to check on the status of it by using one of the status methods of the API. Alternatively, you can setup the callback system in InterFAX to receive status notifications for this fax automatically once processing has been completed. Please note, if you poll the web service for the status of faxes, there is a limitation on the number of requests you can submit in a specific time frame. Please review our system limitations for more details. If the status of the fax is still in process (i.e. the status code is < 0), then you will need to wait for a certain amount of time before trying to poll the status again. Once the fax status changes to a "completed" status (i.e. status code is either "0" or > 0), then you will update the database with the resulting status. Please note, after the fax has been completed, no further attempts will be made on this fax and so the fax status will not change from this point on. This process is detailed in the following diagram.